Corning helped create the LCD glass industry by inventing a process for making thin, flat glass with exceptional stability and unparalleled surface quality. Today, we are leveraging our expertise and assets to drive the next round of display innovations – better images, ubiquitous touch, flexible displays, and new form factors. We are the global leader in Display. Our priority is to deliver stable returns and win in new display categories, and we expect strong progress for our Display business. Corning is the lowest-cost manufacturer in display, and the only manufacturer to have scaled glass production to Gen 10.5. We set the standard for quality, leading in attributes such as size, thinness, and total pitch variation. Our Display market-access platform provides numerous advantages, including twice the revenue share of our nearest competitors at half the manufacturing costs and with the majority of industry profits. Corning is using its competitive advantages to stabilize returns and making great strides in reaching mid-single digit annual LCD glass price declines. This is an important milestone toward the goal of maintaining stable returns in Display. Our quarterly investor calls provide more details about the factors driving our view of a more favorable pricing environment. 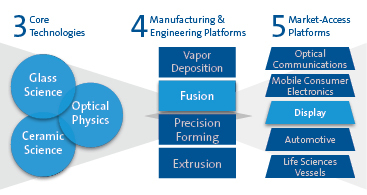 Our advantaged fusion platform is key to winning in new display categories. For example, to respond to demand for ultrathin, ultrabright displays, Corning is ready with Corning Iris™ Glass. This glass enables designers to reduce set thickness and narrow bezel width for a slim, sleek look. We’re also emerging as the industry’s display-glass leader for rigid and flexible OLED panels. Maintain stable returns and win in new display categories. Corning has leveraged its deep customer relationships, materials science knowledge, and process expertise in display to enter new markets.